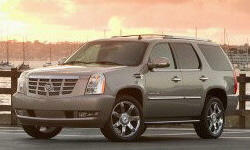 Cadillac Escalade Pros and Cons | Page 1 of 1 | Why Not This Car? What drives people to buy (or not buy) a certain car? TrueDelta's members share Cadillac Escalade pros and cons based on their real-world driving experiences. replaced all 4 shocks. Only lasted 30k. Already all 4 needs to be replaced again. Two door actuators stopped working. Two door handles broke. Motor for rear lift gate stopped working. got a flat. Had to call tow truck. 80k suv don't have spare tire. 10.5 to 12.5 mpg average since new. Easy access to a 3rd row seat that has ample room and comfort. Very good looking exterior stying.